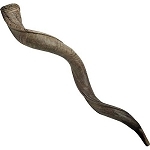 Here's a natural Yemenite Shofar that's just right for any special time of the Jewish year, including the all-important High Holiday Season. This outstanding 100% Kosher yemenite shofar looks and sounds great. Size: 81-86 cm / 32-34 inch.